1939: Radio station WJSV in Washington, D.C. recorded their entire broadcast day. From 6 a.m. to 1 a.m. the following day a "time capsule" was created for posterity. Of important note is Franklin D. Roosevelt's speech to Congress encouraging repeal of the U.S. Neutrality Law. 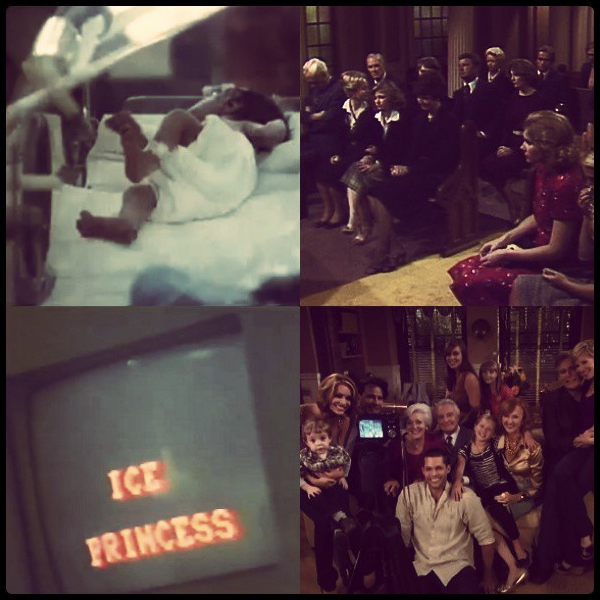 Below are recaps for the daytime soap operas that aired on WJSV that day. All totaled, 18 daytime dramas were heard during the course of this broadcast day. The high number of soaps presented on the schedule underscored what an important, dominate genre this was on radio at the time and what a sought-after audience women must have been. 8:45 a.m. Bachelor's Children - Sam explained to his wife, Janet, how bills were brought before the legislature. 9:00 a.m. Pretty Kitty Kelly - Michael and Martin worked to proved Kitty was innocent of Madmoiselle Dupin's murder. 9:15 a.m. Myrt and Marge - Myrt and Marge worked on the new Myr-Mar Theater project at the 49th Street theater in New York. 9:30 a.m. Hilltop House - Bess noticed how restless John was as a result of Gwen's visit. 9:45 a.m. Kay Fairchild—Stepmother - Kay arrived at the Fairchild house for a talk with her father. Peg rejected the advice of Kay and John about Agatha Clark. 10:15 a.m. Brenda Curtis - Brenda's husband, Jim, was fearful of losing his biggest case and was annoyed with Brenda's receiving an offer to return to the stage. 10:30 a.m. Big Sister - Ruth and her fiance, Dr. John Wayne, planpned a day in the country, when a young friend collapsed while talking with them. Ruth visited a seamstress who was his close family friend, who offered to make her wedding dress. 10:45 a.m. Aunt Jenny's True Life Stories - The return of an old flame may threaten the marriage of Molly Allen. 11:15 a.m. When a Girl Marries - Joan and Harry discussed their plans for marriage, and Harry was troubled by a client's possible change of lawyers. 11:30 a.m. The Romance of Helen Trent - Helen had set up a dress shop in partnership with Chris Wilson, and she was faced with the dilemma of whether or not to hire a spoiled girl to help with design. 11:45 a.m. Our Gal Sunday - When Sunday's uncle complained he wished he was in London, she convinced him he was needed where he was. 12:00 p.m. The Goldbergs - Molly Goldberg became suspicious of the new chauffeur, George Stark, who was delivering a mysterious baby somewhere, and had nervous mannerisms. Jake disregarded Molly's concern. 12:15 p.m. Life Can Be Beautiful - Steven Hamilton was depressed about his having been crippled and unable to work in Henderson's law office. Kate Henderson visited, and convinced both Chichi and Steve that he was still useful to the firm. 12:45 p.m. This Day is Ours - Eleanor had reservations about her coming marriage with Curt which were aggravated by their friends' (the Simpsons) marital problems. 1:15 p.m. The Life & Love of Dr. Susan - Susan and others awaited news of Butch Bixby's big game. 1:30 p.m. Your Family and Mine - Judy was by Woody's side when he woke up after surgery. 3:15 p.m. The Career of Alice Blair - Alice thought Myra was getting too close to Uncle Andy.